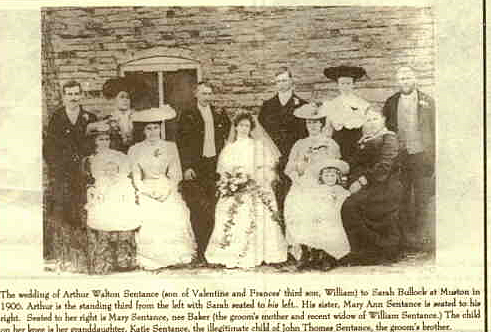 A picture from a newspaper report describing the marriage of Arthur Walter Sentence to Sarah Bullock in Muston, displayed in the Boulton Sword Family tree on Ancestry.co.uk. A search for this article in the British Newspaper Archive was unsuccessful, possibly because it came originally from the Melton Times, which has not been included in the archive. The story of John Thomas Sentence is complicated by the fact that his family spelt their surname as both Sentence and Sentence, and the handwriting on old documents can be ambiguous. He is one of the men named on the Bottesford ‘church list’ of WW1 Servicemen. John Thomas Sentence was born on the 12th February, 1885, at Sedgebrook, and baptised at Barrowby on the 24th March, 1885. He was the youngest child in the large family of William and Mary Sentence (neé Baker). His father was a farm bailiff/foreman. They lived at Beasley’s Farm, Sedgebrook Road, Barrowby, where they had farm servants and labourers living with them. A number of Public Family Trees displayed on Ancestry.co.uk (the Newton, Boulton Sword, Dudley Bromilow, Benson and Holdsworth family trees) combined indicate that William and Mary Sentence had at least 15 children: Mary Jane (b.1864), Robert (b.1866), Eliza (b.1867), Ann (b.1869), Elizabeth (b.1870, Hubert Edwin (b.1872), Henry (b.1873), George William (b.1875), Reginald Henry (b.1876), Frank Stanley (b.1877), Rebecca (b.1877), Emily (b.1880), Albert (b.1883), Arthur Watson (b.1883) and finally John Thomas (b.1885). However, in the census of 1891, only three children, Mary Ann (b.1874), Arthur (b.1883) and John T. (b.1885), were at home with their parents, together with John Baker, Mary Sentence’s agricultural labourer father born in 1822, and three farm servants. In the 1901 census, there were four of the children at home: Mary Ann (b.1876), George William (b.1877, a carpenter ‘rough’), Arthur Watson (b.1883, a waggoner) and John Thomas (b.1885, an agricultural labourer). These birth years agree more or less with those given on the above list with the exception of Mary Ann, in that there was no daughter named Mary or Ann born around 1974-1876 according to the family tree information. John Thomas Sentence was admitted to Sedgebrook Church of England village school on the 24th March, 1890, aged 5, and left the school on the 3rd October, 1898. In 1911, he lived at 27 High Street, Bottesford, and was employed as a gamekeeper. He was living with his mother, Mary, who described herself as a “housekeeper”, and his sister Mary Ann, age 32, an “at home charwoman”. Also listed was Kate, aged 6, born in Harlaxton in 1905, who further research suggests indicates that she was the illegitimate child of John Thomas Sentence. William Sentance died in 1918 aged 77, and Mary in 1923 aged 71. Newspaper report (possibly the Melton Mowbray newspaper) describing the marriage of Arthur Walter Sentence to Sarah Bullock in Muston. The caption names some of the people in the picture, but not all. The un-named man standing at the extreme left of the picture could be John Thomas Sentence. He would have been 21, while his brother, the bridegroom, would have been 23 at the time. Kate, John Thomas’ infant daughter seen on her grandmother’s lap, would barely have been a year old. John Thomas Sentence was married in 1908 at Witham on the Hill, near Bourne, to Emily Hill. No service records for John Sentence/Sentance with the relevant date of birth have been found. 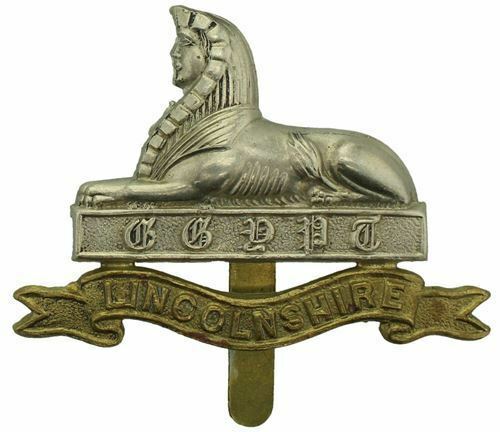 However, there is a Medal Roll Index Card (MIC) for John Sentence, Private 35655 Lincolnshire Regiment then 25929 Labour Corps, which may be the man described here. Another MIC exists for a Private John Sentence, 268615 Notts and Derbyshire Regiment then 235055 8th Battalion Suffolk Regiment, but he was Killed in Action on the 31st July, 1917, and remembered on the Ypres (Menin Gate) Memorial. Electoral Rolls reveal that in 1923, he and Emily lived at Geeston, near Ketton in Northamptonshire, and then in 1929 at Southorpe, near Barnack, Cambridgeshire. In the 1939 register, he may have been the man recorded as John Sentence, born on the 17th February, 1885, a joiner’s labourer, who lived with Mildred Sentence, a widow born on the 11th February, 1895, at Sapperton, near Sleaford, but this is not certain. There is a record of the death of a John Thomas Sentance in Grantham March 1968, age 82.